See that ^? Oh yes, there is something new coming from Luvs. Luvs with Night Lock isn't available on retailer shelves nationwide until September 16th, but I was provided with an exclusive sneak peak at the product, even before it becomes available! The Luvs with Night Lock helps keep babies dry through the night. I don't know about you, but I've woken up to too many leaks in the morning. I am not a fan of leaking diapers. Babies who sleep through the night often sleep 8-12 hours. That is a long time for those diapers to keep everything in...and this is also one reason why we don't cloth diaper at night. It's difficult for diapers to keep babies dry and comfortable throughout the night, so I was excited to see how these worked! The Luvs with Night Lock definitely did their job. Both of our youngsters were still comfortable in the morning, and there were no leaks! 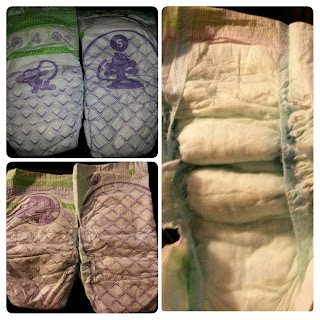 New Luvs with Night Lock is the size 4 (left) diaper, the size 5 is a traditional Luvs diaper. Here are a few photos of the new Luvs with Night Lock and a traditional Luvs diaper. The new Luvs diaper has a green border on the top, with a softer tab landing strip. *Edit* I have learned that some regular Luvs have this new look, too- I didn't know! Our Luvs hadn't been changed yet. The monkey is still there, just with a cute new pose. 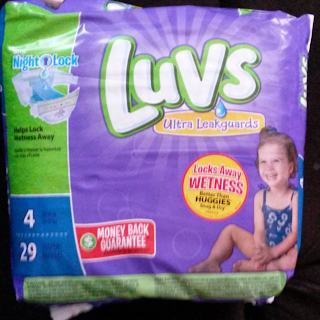 New Luvs with NightLock offers the largest absorbency area EVER to lock away wetness, even overnight. So baby has a restful night of sleep and mom has a more peaceful night to take care of – well, Mom! 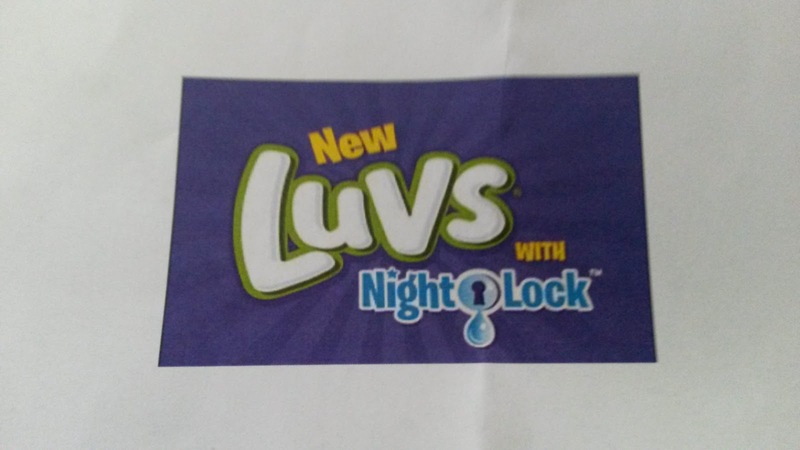 Beginning September 16, 2013, to coincide with Luvs with Night Lock appearing on shelves, for the first time EVER, Luvs will be offering print-at-home coupons Luvs.com. Hopefully these are better than night time diapers/pull ups our littlest wakes up with leaks all the time. We expect a new bundle of joy in our family before the end of the year and finding a great night-time diaper is always a challenge, so I'd love to win this. I have a heavy wetter, so yea, lots of leaks. We've only used Luvs a few times and they have been okay, maybe these will be better. my LO always seems to be a heavy wetter at night so I would love to try these out! !